Out of the City and into The Wild. Plumpton is a great train station! Just 50 minutes from Clapham Junction and you’re minutes away from a glorious off road trail up on to the South Downs. Was a bit of a last minute idea, but the core of it was a wish to watch the sun go down by the seaside and a memory of riding to Cuckmere Haven with my daughter about 15 years ago! So, off the train, and heading south to a track that leads up on to the South Downs. Plumpton Bostall. I made the mistake of thinking that a couple of dry days would have made everything dry. Nope. Still muddy in places, and a slippery mix of mud and chalk sometimes. Weather glorious, so the occasional slip and slide was rewarded with clear wide skies, sparkling clean air in every breath on the climb and, on topping out, that sweep of views spreading out for miles, winter clear light still, fading to a slight haze in the far distance. Rode a stretch of the South Downs Way to Ditchling. Back on the road and then down. I didn’t want to hit the main road so turned left on to a woodland track and after a little bit of riding around sticky paths I ended up in a place called Stanmer. A lovely discovery. Pretty church and tea room. From here I took a quiet road which led on to the cycle route alongside the A27. Which isn’t great. Could be so much better if it was properly maintained and adequately signed. Same old story. Turned off this to take the road through Rodmell, Southease and Piddinghoe to Newhaven. At Newhaven, I searched out the a track called the Vanguard Way which took the bike along rough tracks, a hike over a railway bridge, more rough tracks, then what seemed to be an old, decayed small goods railway submerged here and there under pebble beach and a realisation the sea is suddenly right beside you! Then Seaford and the sea beside you for a few miles more. I wanted to see Cuckmere Haven again. As I came to the end of the mapped road, I paused, wondering whether to head back up to the main road from where I could access the northern side of the Haven that I knew from years ago. A voice asked me if I needed help. A local man, in his eighties, an off road enthusiast! No longer able to ride the South Downs, he entertained me for quite a with a few stories from years back, No mountain bikes then. All done on an old three speed. “The tyres were the thing,” he said. Good, heavy treaded tyres. He pointed out the route up to Seaford Head and informed me I would also find a track to Cuckmere Haven, but the southern side. Just as beautiful, he assured me. So that’s what I did. Up the concrete track, through to the rough tracks down to Cuckmere Haven, England’s largest undeveloped estuary. Nestled in a crook of the South Downs, a narrow river plain alongside the Cuckmere River. Then back up and along to Seaford Head. The sun was low now. So I turned along the coast path and rode back towards Seaford. Rode most of it slipped and slid the very steepest sections, then back on to the pretty decent wide shared seafront path. As the sun sank lower. Finally I had to tear myself away from the sea and head up to the station. Although unplanned and largely made up on the hoof, map in hand, this proved to be a terrific, if exhausting day. 25 miles doesnt sound much but coupled with 12 miles to and from Clapham Junction, few miles exploring alternatives en route, and a fair bit of picking up and carrying the bike,it felt equivalent to a 60 hilly miler! I have since identified a better off road alternative to the mean and nasty Newmarket Rd.Will have to try it soon! Dawn arrives late up here in the northern highlands, in the days between Christmas and New Year. But can be so clear, bright and glorious, you just have to make the most of the precious sunlight. A change of wind overnight had driven off the rain clouds. A north east wind always seems to bring a drop in temperature and clear skies in wintertime. So, good gloves, a few layers plus one for the saddlebag, warm socks and boots, out the door early to head further north and higher up. And on a bike, in this part of the world, you can’t get much higher than the Bealach na Ba. From Lochcarron it’s 18 miles to Applecross. In early summer I had done a round trip of the Applecross peninsula. Twice. Once in each direction. Camped at Applecross, Shieldaig and stayed at Uags bothy over several days and did a bit of off-road in the area. It had been a great trip, although the Applecross road had been pretty busy with motor traffic and the hazy summer weather meant the views at the top of the pass weren’t as beautiful as I remembered. I had been surprised and not a little disappointed to see how much busier with people driving it had become since the last time I had ridden it, maybe seven years before. A side effect of the successful marketing of the NC500, I guess. But clear, ice free days in winter like this one can’t be wasted, so I decided to head up there again, from Lochcarron this time. There’s a climb out of Lochcarron, a small village, one house wide lining the edge of a sea loch between the water and the steep hill behind it. Then a decent easyish stretch of riding through moorland until you dip back down to sea level and Loch Kishorn. You may think this landscape feels remote and unchanged but the remains of a huge construction yard and dock built for the production of oil platforms are still clearly visible to the west. By 1977 over 3,000 people were working here. The 600,000 tonne Ninian Central Oil Platform was built here. It needed seven tugs to tow it to its operating position in the North Sea and was at the time the largest movable object ever created by humans. The yard went out of business as oil production fell. However, some buildings remain in use, for boat repair and a renewable energy hub. Hard to believe now that 3000 people once worked here. Another mile or so of easy riding and you’re at the junction of the main road with the Applecross road. I’ve ridden past this point many times over the last forty years. But have only turned up the road to the Bealach on a handful of occasions. Weather and time have more often meant the main road was the wiser choice. But today, the winds were gentle (at sea level anyway) and though the weather was getting colder, the roads were snow and ice free, the sky was clear. The first three and a half miles feel like your usual highland pass. Find a gear low enough and you can turn the pedals fairly smoothly. I don’t do fast any more. Even if I wanted to race up, I couldn’t! Anyway, the views as you climb are terrific and you need time to appreciate them. That’s my excuse. And then you’re about 1000 feet up from sea level, with a terrific view behind you and another 1000 or so feet to climb. Then it began to feel a little harder than normal. And from nowhere, suddenly that north east wind blasted through a gap in the rocks and sent me right across the road sideways. Then as the road switched direction again, it became a headwind. And my feet almost ground to a halt, fighting what felt like an invisible giant’s mighty hand pushing me back down! But, those hills, although mostly your enemy, can, sometimes be your friend. The twisting switchback would, I knew soon turn and the headwind would be gone, that giants mighty hand would be turned aside by those implacable, ancient rocks. Somehow, I managed a few more pedal strokes, to move me up the pass to a stretch of road in the shelter of the mountain, out of the headwind. In the next mile or so there is maybe 700 ft of climbing. Out of that headwind. I would never have managed it otherwise. Now I can see the very steepest section of the switch back. It’s pretty short, although it’s not the end of the climb. But it is wind free. Calm. Lowest gear. Still slowly turning those pedals and thankfully no motor vehicles behind me. Or ahead of me. Throughout the whole climb, only a couple of drivers had passed me, each with a friendly wave and smile. Then suddenly, it felt a touch easier again. Back to the familiar gradient of most Highland passes. A few more feet to climb, then it seems like you’re at the top. But you’re not, not quite. A brief swirl downwards, then the Bealach kicks back with a little last hurrah. Tired legs just managed to get me up to the top. And then out of the shelter of the mountain, I rode straight into a world of wind that filled every inch of the wild space around me. A biting wind. You really understand the meaning of that metaphor at times like this. I had done the whole ride in two merino layers and a jersey. And hadn’t realised till now just how cold it was! In seconds all that heat my effort had generated was gone. My teeth began to chatter, my bones began to chill. It was so hard to get my winter jacket out of my seat pack and even harder to get it on. The wind seemed to be determined to rip my jacket away, and batter the last scrap of warmth from my body. I finally managed to zip up my Paramo. Then got my phone out for the obligatory photos. Unfortunately I had to take my glove off to use it. Again, in seconds, my fingers were painfully cold. Then I went for a little walk. It was absolutely beautiful up there and no picture I’ve ever seen, much less the ones I can manage to take myself, can show you just how beautiful. You just have to experience it yourself. My original plan had been to drop down into Applecross, then head back via the main road. However, as I descended the other side of the pass, I realised a few things. Firstly, New Years Day meant nothing would be open in Applecross this New Years Day. So no warming cafe and hot chocolate! Secondly and most importantly, , the wind was largely in my face, bitterly cold, and was so powerful it was bound to slow me down even on a steep descent and my hands, even in liner gloves and the warmest winter gloves I had were already so cold I couldn’t feel the brakes. So after a couple of miles of the 4 or 5 mile descent to Applecross, I turned and started back, to head down the way I had come. It was still one of the coldest descents I’ve done. Even with the wind behind me for most of it. With every few feet, my hands got colder and colder. My toes also began to freeze. After the first two miles I couldn’t feel to brake properly. Thankfully, I had disc brakes and the road was absolutely empty of traffic. By the time I was halfway down my feet were numb in the pedals and I couldn’t feel my hands on the brakes. Eventually, I was down to the last mile or so. Still cold, but some feeling returning to my extremities. Someone on a road bike was approaching from the opposite direction. I could see he was in road kit, shoes, no winter jacket and didn’t seem to have any kind of bag where any winter kit could be. I called out as I passed that it was freezing up there. I envisaged him decending back down in that Lycra shell and wished him all the best. A few minutes later, he greeted me again, riding up behind and saying that he hadn’t intended to ride the pass. Just the first few bits of the climb for the view. Knew he wasn’t kitted out for the top. I saw no other riders. A few vehicles, but nothing like the crazy volume of motor traffic I’d experienced last summer. More like the numbers of cars in the springs and summers of the seventies and early eighties. The easy climbing back up from Kishorn felt much tougher than I expected. I think my legs must have thought it was all over once I was down from the pass. The last little descent back in to Lochcarron was very welcome. Only thirty miles or so, in the end, but some of the best miles you can ride in this country, I think. Possibly my favourite New Years Day Ride. Christmas Day 2016. I have never done the legendary Christmas Day Ride, despite the fact it’s been led by good friends ever since Barry Mason started it. Another good friend and legend on two wheels, Bermondsey Bill has kept it going since then, although I think a couple of years saw it led by another friend, Francis Sedgemore. There are now other Christmas Day rides. LFGSS run one, the Waifs and Strays, and there are occasional alternatives that pop up some years. But the one that starts at the Southwark Needle on the south side of London Bridge, with a feeder ride from Greenwich and a lunch stop in Edgeware Rd, is the original and best. But Christmas is an important date for our family and I have never been able to join it. My friend Katie (aka her_welshness) and I got up at some unearthly hour one Christmas morning a few years back and did our own version before returning to our respective homes in time to prepare a full Christmas dinner for our families. But, a traditional Christmas Eve party till the early hours made certain that was a one off. The forecast looked about as good as it could possibly be for a ride from London by night to the Suffolk coast. Warm, but not too warm, dry and a touch of a tail wind. So, my final decision, always made on the day, was to ride. However, had I not promised to lead a ride from Ladywell up to the start point I think I’d probably have crashed out at home after a much more difficult day than I’d originally planned. Foolishly, I’d booked Lewisham Cyclists to do a Dr Bike earlier in the day. Which wouldn’t have been a problem as it was due to finish at 2pm. Then, I forgot the repair stands so had to ride the heavy bike with trailer back to my house to get them. Then back to Deptford. Then the trailer hitch snapped so the only thing securing trailer to bike frame was a toe strap. Bit stressful negotiating potholes on Creek Rd and Evelyn St.
Then Dr Bike over ran. The whole of Deptford seemed to suddenly need their bikes repairing. I spent ages rebuilding a brake system which had to be taken apart to remove a rack. Looked like a simple job. I forgot rule number 1. Beware of jobs that look simple. They often turn out to be the ones that become almost impossible. Finally, the bikes were mended, the stock and tools stashed away and I cycled home to throw a few bits and pieces in a saddlebag, fill up my water bottles and stuff as much chocolate brownie as I could into a side pocket. Sorted. 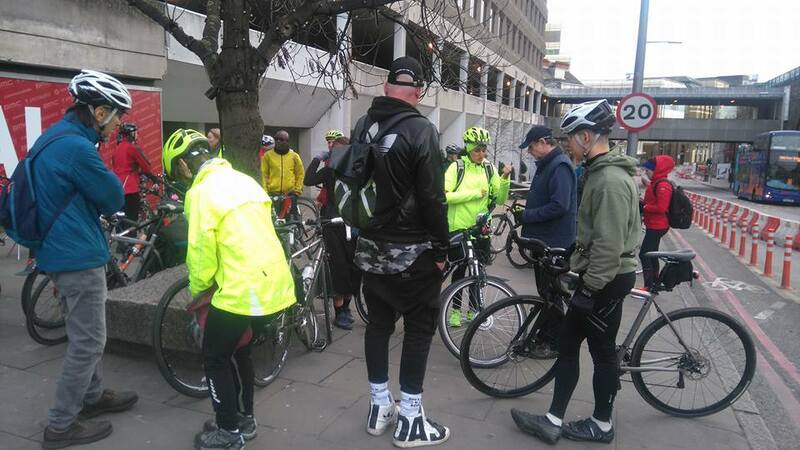 Then out the door to meet the other Lewisham Cyclists who said they would follow me up to Hackney Fields and then eastwards till we met the sea. I felt terrible. Tired, stressed, my back was aching badly from bending over a bike for too long. I felt like I needed a hot bath and bed. I led a slow, amiable pootle of maybe 20 riders through Ladywell Fields to Peckham, where we picked up Bob and Rachel, then ambled gently in a line along the Surrey Canal Path. From there we crossed the Old Kent Rd and then wiggled through to Tower Bridge Rd, on to Cable St then up through the East End, busy and tense on this early Saturday evening, with lots of drivers seemingly in a hurry to get places. I wasn’t in a hurry. It felt relaxing to turn the pedals slowly, chatting with folk beside me. Eventually, we were in Hackney on the crossing of Hackney Rd, just a short pootle past the bike counter on Goldsmiths Row, then Broadway Market and into the Fields. Which seemed even more packed with cyclists than last year. Always hard to tell though. However, although I wandered round several times, I bumped into hardly anyone I knew. Which was strange. Usually, I meet a whole bunch of folk, faces I only ever catch up with once a year on this ride. Fewer old folk, perhaps, these days, like me. I pushed my bike along the slightly parched grass. An area of the park was planted as meadow, delicate grasses with light hints of pink, purple, red and blue peeping through. And beyond that, achingly bright in comparison with the gentle wild flowers, the frontline of Lycra. Nothing wrong with Lycra, but I do like to see a balance. Smart and scuzzy riding side by side is one of the good things about the DunRun. All the different cycling families riding the same ride, maybe not quite all in the same way, but in almost the same spirit. That got broken a bit a couple of times once or twice, briefly I know, when the race mentality began to dominate in the past. But, the worst offenders have been reminded by their clubs that the DunRun belongs to everyone. Race it yourself, by all means, if that’s the way you ride, but never forget it’s not a race, and hundreds of others may well be pootling along on BSO’s and they are as much a “real cyclist” as you. So, I was hoping that all this Lycra didn’t mean more of the club packs snaking at high speed down the Epping Rd, oblivious to anyone else. In fact, Lycra abounded in the Fields but not club colours. A few club jerseys were spotted, but not the huge swathes clustered together like some previous years. Then, at last, a couple of familiar faces appeared out of the crowd, one without his bike this year to wave us off and another who’d come down from Scotland, having moved away from London a while back. My spirits were lifted by this. 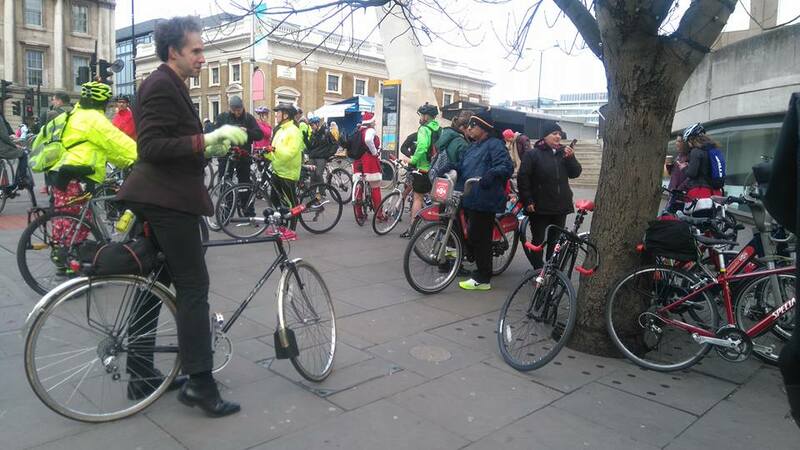 I still felt like I was at home on this ride after all, with the Lewisham Cyclist bunch and a few old friends. Our group waited in the park for quite a while as the exits were clogged with folk beginning to leave in larger numbers around 8pm, edging slowly forward in a tangled queue of bikes and riders. Then, finally, around 9, the crowd of people and bikes had thinned and just a few later starters left. Our little band rode out together and almost immediately, as usual, got split up! We had arranged to regroup at the usual spots so it wasn’t really a problem. The first part of the ride, entitled Into The Woods on Patrick Fields route guide, as though it’s the beginning of some slightly scary fairy story, is a bit of a drag. Uphill to Epping. I don’t push myself here. Ever. And this year, still feeling sore and tired from my working day, I pushed myself even less, I think. It was a fairly unremarkable drag up to Epping this year. We tried to make sure that, even though the group had split, the new folk doing it for the first time were with a selection of people who knew the route. That seemed to work and by the time we all regrouped at the Shell garage, we had lost no one. Off again, towards Epping itself. The clubs who had stirred up so much resentment in the last few years, due to their blasting down the road, oblivious to the presence of other riders, looked to have kept their promise. It was an easy glide, no close overtakes, no rudeness, no pushing to the side. Of course, we had left later than most, so maybe we just missed it! Once through Epping, it’s not far before you hit the darker, more open countryside and then suddenly, our second regroup at Moreton. The Nags Head had opened up the garden and were selling coffee and snacks. Gradually we all rolled up and chatted,drank, munched our snacks, cast our eyes over the rest of the riders milling round the village, in my case looking for familiar faces. None this year. It was apparent that the faster ones in the group were itching to open up and just go. Some left before we had all finished our coffee. Our next regroup was to be Finchingfield just over 20 miles further on. Our group had fragmented even more and now I was with a group of maybe four of us. As we rolled into Finchingfield, the fast ones were already there and again wanting to get back on the road with a few still yet to arrive. This was my low point on the ride. Most folk get at least one low point. My back was still very painful, even more so when I got off the bike. My right shoulder had started to ache for some reason, probably due to my working position during the day, hunched over bikes. I felt tired and very miserable. I grumped about and moaned. Then I looked up at the sky into the glow of the moon, patches of light cloud and way more stars than you usually see in these light stained southern night skies, now thousands shimmering above us. I was reminded briefly of the star stuffed sky I had witnessed on New Years Eve in the north of Scotland, flushed with the green shimmering waves of the Northern Lights. That had been beautiful, but so was this Essex sky, glinting above me, a full moon’s light streaming brightly through thin streaks of dark cloud like scraps of spider web against the deep blue black. And the same beautiful stars. For some reason this lifted me a bit. At Sudbury, the halfway point, I was with just two friends, the rest either in front or behind. We found a cafe open just outside the town. After a brief stop we were back on our way. We’d had a plan for a regroup at the fire station, which had opened up as the feed stop, but it was absolutely packed and we could see no one we knew and then I seemed to get separated from my two mates only to spot the rest of the bunch springing out of nowhere. We rode together again for a while. Then gradually, that group split in two again, the zippy bunch moving ahead into the distant dark, while a few dropped back behind me. I was soon riding alone again, in those hours before dawn. The hour before dawn. Was that a howling I heard? I love this about the DunRun, moving easily between chatting in good company to riding peacefully alone for a few miles, enjoying the solitude, truly relaxing letting the stresses and strains of the working day wash away in the warm night air. Magic. Then, just when you begin to wonder if you’ve taken a wrong turn, either a glint of red appears ahead, some spots flashing, some still and you catch up with a group of folk, chat a while, and discuss their bikes, some of which are pretty weird and wonderful. The quadruple tall tandem was probably the most unusual this year. Or, sometimes, the hum of tyres behind you brings a faster group up from behind who usually ask if you’re Ok as you are alone, and chat for a while before flicking up to their usual pace and waving goodbye. And, at least once or twice every year, when I really think I must have gone wrong somewhere as it seems ages since I saw any riders, one of those welcoming friendly night lights in a jam jar appears and marks out the junction. Thank you to those night light Dunwich fairies who put these out every year. I rode like this till dawn. Which was less spectacular than last year, but warm and welcoming, gentle golds and pinks pushing up from the horizon. At Needham Lakes the toilets were open. Hooray! And not too horrible! Hooray again. And Needham Lakes Pinarello Style! After Needham Market, the time and the route always flies by for me. I felt a hundred times better than I had done at the start. I have learned to pace myself and take the first 30 miles of a 100 miler easy and often find I have more energy at the end. Unless it’s a really hilly route. Which the Dynamo isn’t. Despite my later start I was now passing riders who I had seen leaving about an hour or more before me. I slowed down on a short rise about 15 miles from Dunwich and chatted to a young girl climbing up very slowly. We discussed knee pain for a while. I think she may have been pushing too high a gear on the hills. We rode together for a while and then I pushed on a bit and she dropped behind, waving me goodbye. She decided to take it really slow. I do hope she made the last 15 miles or so. At Framlingham I turned off the main route and rode up some rough lanes, past the castle, quite a fine building. In the fields alongside me I spotted a hare, sitting up, back straight, still huge ears pointing upwards, listening intently, still. A green woodpecker swept out of a large tree on my left and swooped across the fields to a small copse of oaks, its distinctive bobbing flight, up and down, up and down, unmistakeable even at a distance. I followed these quiet empty lanes as far as Bruisyard and shortly after, rejoined the main route. Now, I began to spot the returning riders, those who’d already reached Dunwich, turned round and were on their way back, maybe to Ipswich for a train, or their own local home, or possibly, all the way to London. I’ve never even wanted to try doing that. All this way, to the seaside, just to turn round and go home. Seems like a waste of a Sunday and a journey to the seaside to me. I was looking forward to the sea and some serious beach time. I waved hello to them all as they passed. It wasn’t long before I passed the familiar Dunwich 7 miles signpost. No longer with an added digit after the seven. I forget what year some joker thought that would be amusing. And then, no time at all, sharing the swoop down to Dunwich itself with dozens of other riders, in the warm sun for a change. Then at the junction in the village, busier than ever these last few years even at 7am, with cars manoeuvring their way down to the beach to pick up weary riders, jostling for space with a steady stream of cyclists both going to and leaving the beach, I went right, beach wards thinking how much better it would be to park a couple of miles away from the beach and let them ride to you, if all you are doing is picking them up. I headed straight for the beach, up past the cafe with its huge queue out the door. Off my bike, pushing it down the shingle, bikes and riders spread out all around. I dropped the bike, and just walked straight into the sea, fully clothed, sandalled feet protecting my tender toes from the hard pebbles. Although I’ve done ten Dynamos, I’ve swum at the beach after less than half of those rides. It’s not often it’s both warm and sunny enough, for me anyway. This year it was both and the salty waves seemed to miraculously ease my aching back and shoulders. I dived below the surface several times and floated around for half an hour or so. When I emerged I spied one of my two most constant riding companions of the previous night and called out. 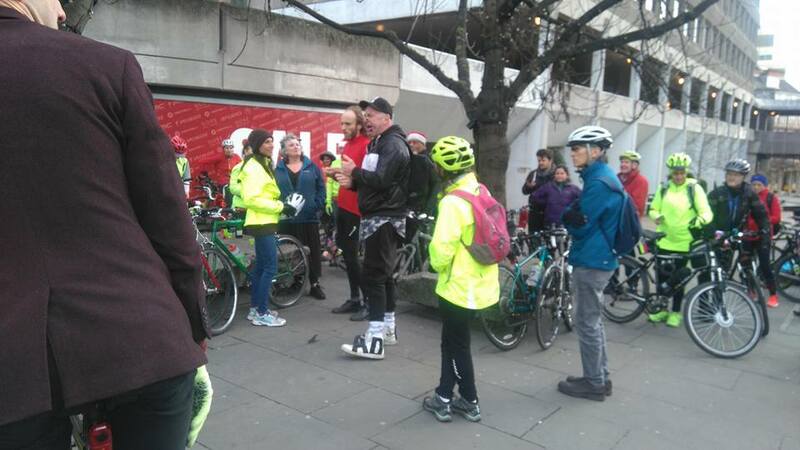 I was soon reunited with the two of them, and over the next hour or so, spotted most of the Lewisham Cyclists group I had begun the ride with in London Fields. Some of them were booked on to the coaches. We enjoyed some quality beach time with a drop of bubbly and smoked salmon bagels that one of our members brought along. She had driven down to give a lift back to some (no, she didn’t park in the beach car park!). By now, the sun was pretty high in the sky and baking hot. Time for another swim! And then time to wave goodbye to folk who were taking their seats on the coaches. By 1pm, the beach was emptier and I was the last of the Lewisham contingent left there. I had waited this long to try and catch up with an old friend. However I had left my phone at work so had been unable to contact anyone all night and when I finally left at about 1.15, unable to wait any longer, I wasn’t to know that about 15 minutes later he would arrive on the beach. And, as I rode off through the Suffolk countryside, navigating my way with a map borrowed from a Southwark Cyclist member who was working hard all that morning to get folks and their bikes sorted on to coaches home, (Thanks, Bob) to meet some friends from the area in a pub somewhere north of Dunwich, I wondered how long it would be before the next Dunwich Dynamo came along when I would be able to swim in my clothes and dry off in the sun on the beach afterwards. Not once but twice. NB. I took none of these photos. My phone (also my camera) was at the bottom of a box of bike tools all weekend! I have to credit Fiona McKillop, Alex Raha, Sanjay Grover, Phil Thrower and Steven Edwards for these shots. Thanks for their generosity in allowing me to use them here. I woke up on my second morning on this lovely campsite early. It’s fully light here at this time of year from about 3.30 am and although I curled back up in my sleeping bag when this first sky lightening occurred, the warm sun was beginning to heat the tent. Hard to sleep when that starts. I had planned to head north today, having spent a good bit of time exploring what South Ronaldsay had to offer, on foot and awheel. I took the causeways across from south Ronaldsay on to the Orkney Mainland via Burray, Gills Holm and Lambs Holm. It proved to be fascinating ride including glimpses back into Orkney’s past, with views of the rusting hulks of block ships, still visible as you pass over the causeways, old vessels deliberately wrecked to protect the Royal Navy in Scapa Flow. When finally they failed to stop a U boat getting in and sinking the Royal Oak, during the Second World War they were replaced by the Churchill Barriers. These are now the Causeways themselves, built by Italian prisoners of war, working alongside British civilian labourers and building a relationship with the Orcadians which lasts to this day and to which the delicate Italian Chapel, perched on the edge of Lambs Holm still bears witness, whether you hold to an organised faith or not. This whole story is both desperately sad and enormously uplifting at the same time. About a week after this, I was to wake up back on mainland Scotland, to discover the referendum result. If only we didn’t have such short memories and could learn more from our shared histories and experiences, rather than worry about perceived differences. Leaving the Italian Chapel, I went on to Kirkwall. It wasn’t far but there was a pretty strong headwind most of the time. A headwind which sweeps up and over the headlands, so you can be climbing a reasonable gradient and still have a headwind to contend with as well. This pattern of weather was to dominate my whole trip in fact. Dry, bright and sunny, but with a brisk north easterly, which occasionally became a very strong wind. So I was pleased to reach Kirkwall, a fair sized town, with an impressive red stone cathedral dominating its centre. It was also pretty full of visitors that day, plenty of coach tours plus the passengers off a massive cruise liner that had docked in the newer harbour, 2 miles outside the centre. And, more importantly, for a hungry rider who’s been battling a headwind, tea shops, cafes and a decent supermarket for supper supplies. I made my return trip into a sort of circular tour of the southern part of mainland Orkney, going back past the airport. I had a tailwind for some of this so my feet felt much more lively in the pedals on the trip back through green fields and moorland under sunny skies with ever changing views of sea and causeway. Once back at my tent, a tea of salmon, steamed spinach and new potatoes took about 30 minutes to prepare and once consumed I walked down to the beach for one last visit. The next day I broke camp, packed the bike and headed up to Stromness planning to camp there before heading to Hoy. I was already realising that the strong winds were making my “50 mile a day when packed” estimate not exactly unrealistic, but just not the easy day with plenty of time to stop and do other stuff that I had planned it would be. The headwinds were bad enough, but the cross winds were worse. My wrists and arms ached from constantly having to keep the bike from veering sideways into the main stream of traffic, or on to the rough verge at the road side, when a cross wind blasted me. And while the Orkneys lack any really tough climbs, there are rises across the headlands and up from the causeways which, unlike tougher climbs up proper hills, offer no protection from the headwinds. So you can be climbing, with all your kit, and still fighting a headwind. It was definitely not the easy ride I thought it would be, when I had been planning it and thinking of other trips I’ve done with far more regular climbing. Plus, of course, each year, I get a bit older! It looked like my 50 mile a day average was going to drop a bit, especially if I wanted a couple of days walking fitted in. It was afternoon when I finally reached Stromness. Which appeared completely closed on this lovely windy, sunny Sunday, apart from a supermarket and a couple of cafes. The campsite, on a pier next to a golf course, was very busy and the only pitches left available to tents were way back from the sea, facing some grotty warehouses. Not for me. I decided to take the last ferry over to Hoy and camp in the garden of the hostel at Rackwick Bay. It’s just a little ferry and takes only half an hour. By the time I finally reached Hoy it was gone 8pm. Then I had to ride a few miles across the island to the hostel. I stopped a few times, convinced I could see the sea eagles that nest in the cliffs here. The terrain on this northern part of Hoy was very different to Mainland Orkney, less green farmland, more wild hilly moorland, reminiscent of the Highlands. When I finally arrived at the hostel I discovered that camping there is no longer allowed. The SYHA no longer run the hostel and there was a rather unfriendly, handwritten note on the front door saying that the building was hired out privately for two weeks and please use the toilets on the way to the beach. On the garden gate was a no camping sign. It was now getting late. I was pretty tired, having ridden well over 50 miles with full camping kit, a large proportion of it into a head or crosswind. Luckily, it was still beautifully sunny and bright, despite my watch telling me it was nearly 10pm. I rode down in the direction of the beach. There was a patch of flat land on the way with Camper vans and cars by the toilets. Not a pleasant place to camp. I looked at my map, which indicated a good sized stream running through the fields beyond, towards the beach, and a small building marked Burnmouth which reminded me there was a bothy there. Two farm gates were open so I rode through along the path and down to the bothy. The bothy garden was completely enclosed by a drystone wall, which though beautifully built made me feel a little closed in, so I chose a spot outside the wall, overlooking the beach. By 11pm I had pitched, brewed and made a hot chocolate. Still bright sunshine, just a hint of sunset tones in the sky and edging the clouds. But, by now, I was exhausted and fell asleep wrapped up in my sleeping bag, safely inside the tent, but with the front flap still tied back. Luckily it stayed breezy enough all night to keep midges at bay, even if I did wake up about five hours later with a very cold head. Despite the brisk northerly, the weather was still gloriously sunny. I woke in the morning, realising I had fallen in love with the Rackwick Bay wild pitch and decided to stay at least a couple of nights to do some walking. After a leisurely breakfast followed by a paddle in the sea which was literally a few steps down the pebble beach on to the sand and into the cool clear sea, I packed a bag and took a hike up to the Old Man of Hoy. I could see from the map that, although it wasn’t visible from my tent, it was literally just behind the cliffs I could see from my wild camp pitch. I packed a bag with a flask of coffee and some lunch and zipped up my tent. Despite the glorious weather, no one else was around on this Monday morning. It was an easy walk up, past the few houses that make up the tiny settlement, my only company, seabirds and a few sheep. At the top of the climb , walking along the path, the imposing seastack begins rising up into view, out of the sea, gaining in grandeur as you walk up and along the cliffs towards it. The nearer I got, the more inappropriately named this striking, imposing natural structure seemed to me. Less an Old Man of the Sea, more an Old Warrior, bravely standing tall and straight against the hammering of the waves, but ultimately doomed. Perched on the edge of the cliff, it seems just a few yards away, a few yards with crashing waves and sharp rocks way below. I had a quick snack, during which I could see a few coloured specks at a distance, back on the path I had used earlier. Specks which grew bigger all the time, bobbing from side to side with a movement and definition that grew larger and more human all the time. More folk on their way. I packed my bag and decided to explore hilly Hoy a bit more. There are few marked paths on Hoy but it’s a small island and in clear, bright weather like this not hard to find your way across the heather and bog up the hills making up your own entertaining walks across this end of the island. It’s far more reminiscent of mainland and Highland terrain than the Orkneys I had seen so far, which were much more low lying, green and agricultural. I tromped around for several hours up,and down, trying not to disturb the nesting wild birds which seemed to be everywhere. Every cliff edge delivered terrific sea views. As I turned from the sea to head back inland I realised the brisk wind was getting even brisker and the higher I climbed the harder it was to walk into it. I decided to head back down to lower levels and enjoy my beach wild camp in the sheltered bay. The wind was indeed gathering even more strength. Luckily, being a northeasterly and as Rackwick Bay is on the western side of Hoy I had some decent shelter. Otherwise I would have definitely had to repitch my tent away from the beach. This was to be my last evening at Rackwick, so I prepared to enjoy it. As I was finishing my supper, a Dutch hiker turned up. We chatted for a while and he then decided to pitch in the bothy garden and I noticed his pristine Trangia set, like mine except it was gleaming and unbattered. “nice new Trangia” I remarked. “More than thirty years old”, he replied. I made a mental note not to let him see my scratched, battered and burnt set. Too embarrassing. All his kit was amazingly gleaming and bright . How do these people do it. It was a pretty windy night, but I find the battering of the wind against the tent strangely reassuring. All that strength and power howling around and just a little bit of nylon protecting you perfectly. The next morning I had decided to have a leisurely breaking of the camp and enjoy yet another beautifully sunny morning to the full. I was up early though, around 5.30 and Mr Dutchman appeared to have gone already. I filled my water containers, made several cups of tea, a bowl of porridge, packed the kit, made a pot of coffee, packed the cooker, took the tent down and sat on the beach drinking one last cup of coffee. And saw Mr Dutchman emerge from the bothy, looking tired and tousled. He had been unable to sleep in the tent due to the wind and had gone into the bothy in the middle of the night, desperate for sleep. I wondered how he was going to cope on the rest of his Scottish trip if he didn’t get used to sleeping on windy nights. I finally finished packing the bike and, slightly reluctantly, rode out of Rackwick on a glorious morning, the bay flooded with sunshine, sparkling off the clear sea. The farm gates on the fields which were all conveniently open on my arrival, were now padlocked shut! I hoped it wasn’t personal, but realised I must just have been lucky on the day I came. Now I had to fit the bike and luggage through an extremely narrow wooden kissing gate. So the bike had to be unpacked, pushed through on its back wheel and then repacked. Then I was off. Not back to Moaness, for the Stromness ferry on which I had arrived, but down the length of the island on its only road, about twenty odd miles, to Longhope, and then back about 6 to Lyness, for the ferry to Houton on Orkney Mainland. I wonder why I have never thought of coming to Orkney before, given how much cycle touring I have done in nearly every other part of Scotland in the past. Perhaps because It’s north and east rather than north and west, the direction I’m usually headed. And also because access to the ferries that bring you over is via the A9, the far northern section of which I am not a fan. It’s narrow and very busy with big trucks. Not the best cycling experience in my opinion. However, there are options which allow one to avoid it, especially now my daughter is living in Helmsdale, right at the end of a strath that has a handy road (or train) that can take you up to the north coast too. So, up on a Tuesday night sleeper train to Inverness. I still love this sleeper, even now it has been taken over by a new franchise that seems to have ditched the wonderfully cheap bargain berth option. The staff are still invariably lovely, and if you book very far in advance, its still worth it for a treat. The seats are still available at more affordable prices, if you can hack sitting up all night. They’re bigger than the usual seats and can recline a bit. The staff used to bring you blankets if you asked. I don’t know if they still do, because I did pay a bit extra for a berth. Slept right through. Didn’t even wake up when the trains are separated at Edinburgh and head to their individual destinations of Fort William, Aberdeen and Inverness. Then, in the morning, from Inverness up to Helmsdale. I decided to train it this time, to give me more time with my daughter, although there is a lovely route I have ridden before, doable in a day, especially if the Cromarty Nigg ferry is running. But don’t make the mistake I did, a few years back, neglect to check the ferry beforehand, arrive to find its cancelled due to the wind, then have to ride across the top of the Black Isle into the very headwind that stopped the ferry from running. Makes the journey much longer and much tougher. In those days there was a hostel in Helmsdale. On the previously mentioned occasion, I was so tired by the time I eventually got there that I couldn’t face finding a pitch for the tent so decided to check in at the hostel. By now it was getting dark, the whole village seemed empty of inhabitants , so I rang the hostel number from a phone box. (That’s a clue to how long ago this was!) The warden could probably hear I was too tired to listen to the very simple directions she was giving and finally said, “Just pop your head out of the box, dear, and look up the road.” I did so and could see a small figure a few yards up on the corner of the main road waving at me. Within a few minutes I was inside, enjoying the hot cup of tea she’d made. Friendly welcome, warm bed. Sadly the hostel is now closed, sold by the SYHA a while back. A tale that I was to hear again on this trip. The building is still there at the top of the village. But that was then. Now, I spent a couple of days with my daughter, rode up the strath on a glorious summer day, broom and gorse in vibrant bloom, along with dozens of other little wild flowers I couldn’t name. Sand martins nesting in the sandy deep banks of the Helmsdale River, a couple of salmon leaping. Paused a while at the slightly eerie Baile an Or, where a short lived gold rush never really delivered on its promise to the hopefuls who arrived here, prepared to live in a shack village in the hope of making their fortune. You can still hire gold panning equipment from the Timespan museum and art gallery in Helmsdale and have a go yourself. There is indeed still gold in them there hills which washes out into the river here. On one of the Spring golden hillsides overlooking Helmsdale, is a white stone, high up in the hill. If you look at my photo carefully, you might spot it, near the top on the right. It’s not naturally white. My daughter told me it was painted white as a protest against the Iraq war. And there it is still, shining white in the yellow at this time of year, later in the year, white in the purple haze of heather. Even here, about as far from Iraq as it feels it could be, someone felt in their heart this was a wrong, wrong thing and wanted to express that dissent. Oh the broom, the bonny, broom. and the white stone of peace, high up. Then, having already ridden the road from Helmsdale up to the north coast unencumbered by my camping kit, the next day I cheated again and took the train to Thurso. From here I rode along the coast road to Gills Bay. This stretch of the coast road in the east is much flatter and easier riding than the western section. I passed Dunnet Head and was tempted to ride out to it, but didn’t want to risk missing the ferry, so stopped and took a look from a distance and then carried on to Gills Bay. Here there is a small ferry which takes a shorter route to the Orkneys, landing you at St Margarets Hope on South Ronaldsay. St Margarets Hope is a small village with a shop and cafe. I stocked up on food for a couple of days tea then rode down to the south of the island, half contemplating a wild camp. It was getting late, although that’s not too much of a problem at this time of year when darkness doesn’t descend till around 11pm and then it’s not really darkness, but a slight dimming of the day. But I was tired and nothing seemed suitable. Wild camping always sounds so romantic, but, having done a fair bit of it, the reality can be messy and uncomfortable if you don’t choose a good spot. It was windy, so I needed shelter, a good fresh water source and flattish ground. All I could find was bumpy, steep ground littered with large lumps of sheep poo and no useable water. The small streams marked on the map were sluggish and dank looking. It was a beautiful evening and I didn’t want to spoil it, so sat down overlooking the sea for a while and decided to ride back to a camping sign I had seen on the way down. And glad I did. One of those spots that is almost as good as a wild camp, a field next to an organic farm run by a lovely guy, Mike Roberts, who will sell you fresh eggs and organic veg, if available. 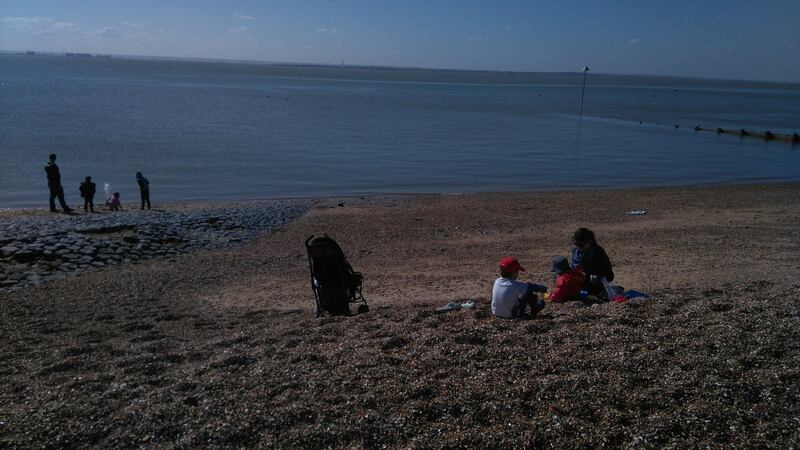 It overlooks a lovely beach that is just a few minutes walk away. Fairly sheltered from the strong northerly wind too, which, though cold, brings a lot of sun and dry weather with it. I blethered a wee while with Mike, originally a southerner like me, who knew Maidstone! But had been here for years and obviously loved the land and knew how to care for it. I decided to spend a couple of days here, and use it as a base to explore as much of mainland Orkney as I could. Planned a couple of out and back trips. The first a trip south and around Ronaldsay. A real feast of beach and birds. Eider duck families with little ducklings in tow. Curlews and oystercatchers desperately trying to distract me from their nests, the latter often flying alongside me for ages to lead me away from their offspring. Evening walks down to the beach, windy sunsets. There is an old churchyard right next to the sea here. And a walk which takes right to the southernmost tip,of Ronaldsay. I’d definitely recommend the campsite. Basic, but beautiful. For those that don’t know there is a group of people that have been riding out of London to a coastal resort most months of the year, aside from the deepest darkest winter ones, for maybe ten years now. I forget when they first started, as I wasn’t on the first couple. A very good friend of mine told me about them and their leader, Simon, who is a character and a half I can tell you. I think it was sometime in 2008, or maybe 2009. Simon has done a lot more in his life than the Friday Night Rides, but they remain the bit in which I was most involved over the next few years. So, back to the FNRttC. Well, yes, my good mate took me along, introduced me to Simon, the leader and a few other people and so it started. Although Simon ran them every month, from March to November, I was never able to make them all. Pressures of work, family, all that stuff. But I did a fair few over the following years. There is something special about riding at night. Main roads through dull, urban areas, normally choked with motors are transformed into ribbons of light snaking through empty streets, with just the occasional raucous group tumbling out of pubs and night clubs, calling after you as you stream past. You can own roads on which you would usually struggle to claim your little scrap of space. And the transition from city to countryside, as the glittering lights gently recede and the moon and stars take over, can be magical. I have turned my lights off (not to be recommended I hasten to add) and ridden along a road in the Mole Valley under a huge full moon so bright the leaves on the trees seemed outlined in silver. I remember riding down the canal near Gravesend, on our way to Whitstable,accompanied by what sounded like thousands of bull frogs, and, by the same canal, being called back for a few minutes by my friend Peter to catch the sound of nightingales singing. That same ride, another rider pointed out to me, the International Space Station clear in the sky above us. Then there is the variety of the countryside itself, rural scenes you know are transformed at night, be it marsh, orchard, woods or the views from hills and moors. (One of the rides goes from Manchester to Morecambe). Anyway, I could go on and on, because I have a whole store of memories like this. But this was going to be a post about my return to the Fridays. Because I have been away for a bit. Well, I’m glad I went back, and extremely grateful that, now Simon is taking a rest from the organisation of them, that others have taken on the task of sorting and checking routes, halfway stops and final breakfast cafes. And they do it well. This first Friday Night Ride ride of 2016 and my first for many months was definitely a ride of two halves. It was also not on Friday night! When the Friday coincides with Good Friday, the ride is held on the Thursday. It’s still an FNRttC, though. The first half provided me with lots to moan about, one of my favourite pastimes, so I was happy. So good to chew the fat, banter and blarney with old friends and familiar faces, some of whom I haven’t seen for a while, even if the opportunity for that was provided by a couple of unscheduled stops in the freezing rain! Let’s be honest, these are always the conditions that provide the best banter anyway. Plenty of good chat and giggles at the halfway stop. For this ride, halfway stops prepared to open up about 3am are hard to find so its down to the services at Junction 31, Thurrock, where I was seriously tempted to lie down under the hand warmers in the toilets. My friend Andy came up with a few creative ways of keeping them running for that purpose, but each strategy seemed to involve the abuse of small rodents, so I reluctantly gave up on the idea. This may make no sense to you, but then, you had to be there! A lot of the Fridays experience is like that. You just have to be there. After, sharing cake, jokes and stories, catching up, we were back on the road and very soon, the rain stopped and we left behind the urban roads and were on quieter country lanes. And, much earlier than I expected, the edges of the darkness began to fade, a hint that sunrise was definitely on the way, something the birds had already worked out, as their singing began, drifting out of the hedges and trees, louder and louder. After a while, I spotted the snowy locks and familiar riding style of the inimitable Peter Walker, the same Peter, who a few years ago had stood and listened to nightingales with me on a night ride to Whitstable. He had ridden out from Southend to meet us and I rode and chatted with him for a bit. The last few miles in what was rapidly becoming warm sun were a joy and the final leg stretch along the seafront to the cafe just perfect. Brilliant blue skies, warming sun, tailwind. The new cafe is a real find, well done leaders. I picked a table in the sun, right over the beach on a great terrace and waited till Peter rocked up so we could breakfast together. It was such a lovely day, I wanted to carry on riding, but I’m not too fond of any of the return ride variations from Southend to London..too much anonymous urban riding, which, while it has some attractions when it’s transformed at night, is dull, boring and busy in the daytime. So rode back with Peter along the seafront to Chalkwell, and waved him goodbye as he headed home. Then I took the train to Limehouse from where I rode to Wapping, down to the river and east to the Greenwich tunnel, under the river and west along it to Tower Bridge, then a little trip to St James Park and finally home the long way via Vauxhall Bridge and several SE London parks. The first really warm sun of the year had brought folks out to enjoy the best bits of London and I joined in the fun, watching it all as I rode by. My legs by now were feeling a bit leaden. And I realised I must have ridden over 90 miles since 11pm last night. I have to admit, the last mile home was a bit of a struggle as I was by now running on empty and of course, living on the edge of Forest Hill, it involved a teeny bit of up. I eventually staggered in my front door, happy and tired. It was still a beautiful day, so I sat in the garden with a glass of wine, some French bread, cheese and salad and fell asleep in the sun. Perfect Easter. Terrific Friday Night Ride. Thank you, Friday peeps.